Enlargement of Figure 5a indicating that ribosomes are attached to the cytosolic side of the transition zone of the ER. 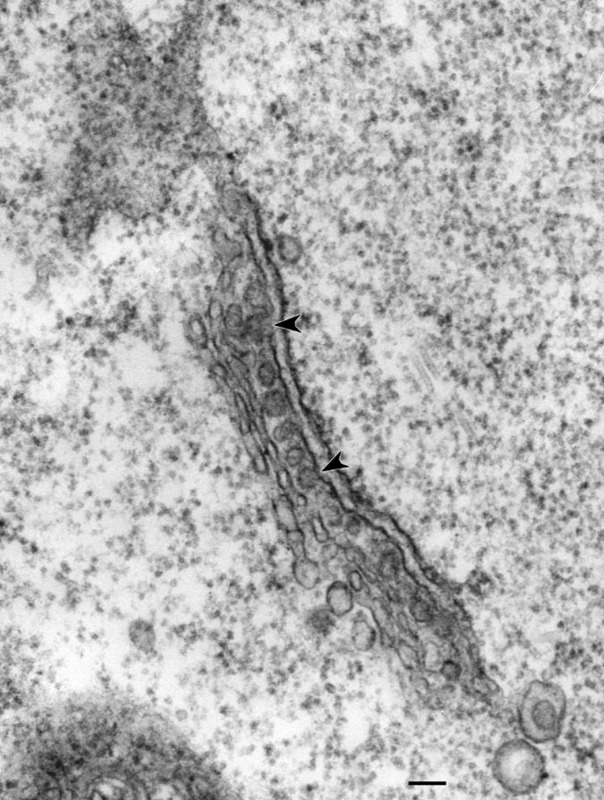 COP-II coats presumably allow the ER membrane to accumulate protein cargo and to evaginate (arrowheads) into a pit which will pinch off into transition vesicles. These then fuse with the Golgi stack which in paramecia consists of only two or three cisternae. Glycosylation of the proteins may occur in the cisternae which may target the proteins to lysosomes, to the plasma membrane, or to the endosomal system. Paramecium does not have sialic acid as the terminal sugar of its complex carbohydrate as part of its glycosylated proteins and lipids. Bar = 0.1µm.